Note taking with iPad: Making our life easier. A few months ago while on break during an event I was working with several colleagues from different language combinations, we had one of those not-so-common moments when we all gather outside the booths and talked about the industry. As we were having this conversation I brought up the note taking topic saying that I had noticed that some of the interpreters were using a tablet while others were working “old-school” with pen and paper. I have been taking advantage of the benefits of the iPad for quite some time. I love showing up for work with nothing but my tablet. No more heavy briefcases with multiple dictionaries. I now have my glossaries, dictionaries, and textbooks in my iPad; and if for some reason I need to consult other sources, I just go online with Safari. It is great to have my calendar, invoices, and even my travel apps handy at all times. Note taking for both, simultaneous and consecutive interpretation are another good reason to go to work with an iPad as well. Although I now use the Livescribe Echo Smartpen for consecutive renditions during press conferences and other non-judicial settings, because of the issue of recording in-court statements that has been raised in some courthouses, I am taking advantage of my iPad with a different application when interpreting in a courthouse, and many times when working in the booth. event. To make it easier to identify your notepads, the program lets you name them, and then it allows you to pick a color for the cover and a paper style for the notepad. Finally, you can link or unlink your notepad to Dropbox, Google Drive, Box and Evernote, you can copy from Dropbox, Google Drive and Box, and you can protect your notes by setting a 4-digit passcode. Once you have a notepad you can write in different ink colors: blue, purple, grey, black, red, orange, yellow and green; you can select the width of your handwriting making the lines and letters bolder or finer, and you can highlight, erase, copy, and paste your notes. You can also choose your paper, turn on the read-only mode, change fonts, and turn on a wrist protection that allows you to write without having to worry about any marks or alterations by your hand and wrist pressing against the screen. This app lets you switch the screen so you can see all of your notes at the same time making it easier to go back and forth without having to shuffle papers at the speed of light. 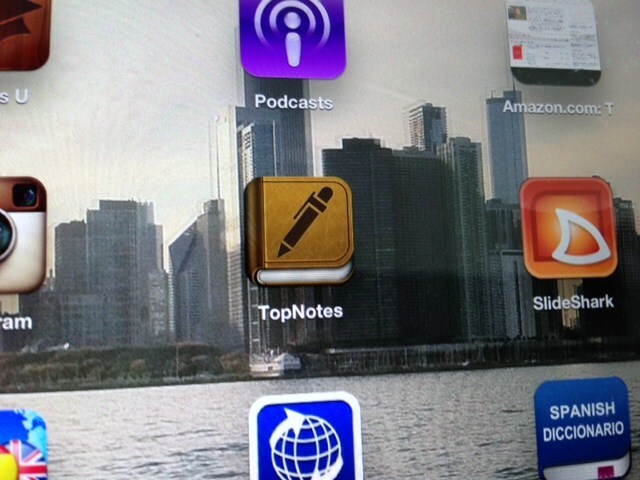 Finally, with TopNotes you can email your notes, upload them to Dropbox, Google Drive, Box or Evernote, open the notes in other apps installed in your iPad, print your notes via air-print, and copy pdf files from your Dropbox and elsewhere so you can underline the text of a presentation or court file without ever touching the original documents. Boxwave from Amazon for bolder writing. It is heavier than Bamboo, its tip will not write with the fine precision of a Kensington, but it is far less expensive than Bamboo and you would not be very sad if you lose it. In my experience I found it better to have them both by my iPad and use the Bamboo stylus to write and the Boxwave to underline or to write big bold messages to my colleague in the booth. Technology has changed the way we take notes as interpreters, and I invite those of you who have not switched to a tablet to give it a try. You will discover freedom and speed thanks to your new tool. Please tell me what apps you prefer and what stylus are more compatible with your handwriting. Are federally certified court interpreters any good? Maybe the NAJIT conference had the answer. When you go to the doctor, retain an attorney, get on an airplane, or hire a plumber, you want them to be honest, good, and competent. So do I; So does society. That is why there are laws and regulations that require they go to school, get a professional license, and comply with continuing training and education. Even when a person reaches a certain age, he has to go back periodically to the Motor Vehicle Division to be retested in order to continue to drive. Interpreters are no exception. Almost everywhere in the United States where a State offers a certification program, its interpreters must comply with continuing education requirements to keep their certification. Translators need to do the same to maintain their certification with the American Translators Association. It sounds logical right? It makes sense. Over the weekend the National Association of Judiciary Interpreters and Translators (NAJIT) held its annual conference in St. Louis, Missouri. This is a yearly event and it is the only one of its kind. NAJIT is the only national professional association for judiciary interpreters in the United States. There are many state, regional, and local organizations that meet regularly and offer training and educational opportunities to their members, but no other one offers this service at the national level. Every year the conference takes place at a different location and offers a variety of workshops and presentations so that all judiciary interpreters and translators can better themselves and meet their continuing education requirements with their respective states. As the main gathering of judiciary interpreters, NAJIT attracts some of the key players in the industry, including the Administrative Office of the United States Courts. This is the federal agency that runs the federal court interpreter certification program. Every year this presentation brings federally certified interpreters up to speed on everything that is happening in the federal interpreter program through a presentation and an open question and answer session with the government officials who know the subject. The presentation was held as scheduled and Mr. Javier Soler and Ms. Julie Meeks were there sharing statistics and information; answering questions, dissipating doubts. Unfortunately, and in my opinion very sadly, only a handful of federally certified court interpreters were there. There are almost one thousand federally certified court interpreters in the United States and there were less than twenty in attendance! Other sessions held simultaneously in the other conference rooms were full of state-certified court interpreters who were attending the St. Louis conference because they wanted to improve their skills but also because they needed the continuing education credits for their respective State Administrative Office of the Courts. Of course, there room was not that empty, there were many people without a federal certification who were attending Mr. Soler’s and Ms. Meeks’presentation because they wanted to learn. And they did learn something that was discussed for the next two days in the hallways of the hotel where the conference took place: Federally certified court interpreters do not need continuing education credits to keep their certification current. Those non-certified interpreters in attendance learned something they didn’t expect, tweets on this issue were the conference’s most re-tweeted throughout Europe where 2 other conferences were held on the same weekend. I knew this information. I have always known this information, but as I looked around a room with just a few colleagues, many non-certified attendees, and a tweet practically going viral, I understood why the federally certified court interpreters weren’t there, listening to the representative of the government agency that regulates what they do and travels half a continent every year to come to see them: No motivation. No need. The only court interpreters who were not attending the conference, and particularly this session were the federal interpreters. The only ones who do not need to comply with continuing education. Let me explain: Unless an interpreter complies with the State of Colorado’s continuing education requirements, he cannot interpret for a defendant who has been accused of driving without a license and proof of car insurance in Pueblo Colorado. Unless an interpreter complies with the State of New Mexico’s continuing education requirements, she cannot interpret for a defendant who has been accused of duck-hunting without a permit in Estancia New Mexico. A federally certified court interpreter who has never attended a class of ethics or a legal terminology presentation in his lifetime can interpret for a defendant who has been charged with running the biggest organized crime operation in the history of the United States. The first two examples are misdemeanor charges that carry a fine, and under some circumstances a brief stay behind bars. The individual in the last example could be facing life in prison. Some states honor the continuing education provided by already well-established organizations and associations at the national, regional, state, and local levels. ATA does the same. The cost to the federal government would be zero if they decided to honor credits obtained at a NAJIT, ATA, or other well-recognized conference in the United States, including some state conferences such as California’s Nebraska’s, New Mexico, and others. They could also honor credits from attending well-known prestigious international and foreign professional organizations such as FIT, FIL/OMT in Mexico, ASETRAD in Spain, and others; and they could also consider the classes taught at institutions like MIIS, University of Arizona, University of Maryland, and others. All of the conferences and organizations above offer training and presentations on ethics, skills-building, terminology, practices, technology, and many more. The reporting of the courses attended could be on an honor basis as many states do at this time. After all, federally certified court interpreters are professionals with moral solvency who periodically undergo criminal background checks. They are officers of the court! These credits could be reported by answering and signing a form at the same time contractors renew their contract every year and staffers undergo their evaluation. And to keep a central record, all interpreters would have to input this information into the system once a year by accessing and updating their personal information on the national court interpreter database system (NCID) that already exists and we access every time we change our address or modify our resume. Federal interpreters are honest, professional and capable individuals who love their trade and take pride on their work. They would happily embrace this change and comply. After all, many are already doing it for their state and ATA certifications. Please let me know your opinion and ideas on this crucial topic. Do court interpreters need to understand the legal proceeding they are interpreting? It is for this reason that during the NAJIT Annual Conference in St. Louis Missouri I will be presenting in Spanish: “Evidence. A comparative Study between Mexico and the United States.” During the presentation I will walk those attending trough the evidentiary process in the legal system of the two countries where the people we more often interpret for either live or come from. We will cover topics such as discovery, admissible and inadmissible evidence, types of objections, exceptions to the hearsay rule, different burdens of proof, judicial notice, best evidence rule, and many more. I invite you to attend the presentation on Sunday, May 19 at 11:00 am during the NAJIT conference in St. Louis. I hope to see you there, but even if you are not able to attend, please tell us if you believe that court interpreters should know the basics of the law, and specifically procedural law. Translation/Interpretation online groups: Should they censor the language used by those posting? …I believe that professional groups, chat-rooms, blogs and list-serves should be open to all professionals. Of course there should be a moderator to keep us all focused on a specific topic when posting on a blog… and to keep obscenity and useless personal attacks out of the professional discussion; however, limiting access in a linguist group because of the language… can result on the demise of said professional group…” Please share your thoughts. Good professional interpreters are usually consumed with taking care of their clients, improving their skills, managing their agenda, and marketing to new clients. This takes a lot of time and energy, and it is essential to succeed in this career. Unfortunately, sometimes during their career some interpreters may experience other aspects of the profession that are less pleasant, more time-consuming, and very stressful. Our professional tools are our brain, mouth, and a language combination. We can make mistakes, we are susceptible to questioning and second-guessing by others, and in out litigious society we are exposed to lawsuits that can leave us with no career, no resources, and a tainted reputation. When our work is subject to criticism and questioning by our peers or by a counterpart in a legal setting. We all have faced situations when in the middle of a court hearing a judge, attorney, witness, litigant, and even a juror, have interrupted our rendition to correct what we just said. Most of the time we were right and they were wrong. On occasion, because we are not machines, and because nobody can possibly know all regional expressions, these voices do us a favor as they correct our mistake and allow justice to be served. These are the scenarios we usually face when doing our job. It sounds simple and straight to the point: Either we are right and we say so in order to keep the process moving along, or we are wrong, and in that case we correct our error. Unfortunately this is not how it happens in the real world. Out there we have to deal with attorneys who are not happy because their non-English speaking client or witness is not saying what they wanted them to say, so the first thing they do is to cast a doubt over the rendition of the interpreter; there are those cases when the non-English speaker passionately defends his “translation” of a term even though we know for sure that he is mistaken. Sometimes the problem may be the judge who does not speak the foreign language, but out of fear of offending the non-English speaker decides to question the interpreter and sometimes even to adopt this person’s rendition of a word or term that you know is clearly wrong. The second situation I want to mention to you is when a case does not end the way that one of the parties wanted it to conclude and the blame is totally or partly placed on the interpretation. The court decision is appealed on grounds of inadequate interpretation, or even worse, the interpreter is sued for damages by this losing party. How can we defend our work when our rendition is questioned and the case goes on appeal? What can we do to protect ourselves in case somebody takes us to court for damages? There are preventive measures that we can take as interpreters to diminish the possibility of having to defend our work, our assets, and our reputation. There are also steps we must follow in case our professional work is questioned or attacked in court. These complex issues have to be addressed, and as true professionals we must be prepared in case this happens to us. For this reason, I will present: “How to Defend Your Interpretation and Professional Reputation as an Interpreter in and out of Court” during the NAJIT annual conference in St. Louis, Missouri on May 18, 2013 at 3:15 pm. I invite you to go to the conference and I encourage you to attend this presentation where we will discuss these sad but possible scenarios and we will explore the different preventive measures that we should always take in order to avoid an adverse outcome, as well as the path to follow once our rendition or our skill has been formally questioned in a court of law. I hope to see you in St. Louis. Hace algunos meses platicaba con una colega y ella me sugirió que escribiera algo sobre los apellidos en español. En esa ocasión hablábamos de la gran confusión que generalmente se desata en algunas culturas debido a la costumbre ancestral y a la práctica jurídica en muchos países de formar el nombre de un individuo en español con dos apellidos: el paterno y el materno. Por unos días pensé cómo abordar este tema y tras un poco de reflexión, decidí referirme al origen y significado de los apellidos en la lengua española. El apellido es el nombre antroponímico de la familia con que se distingue a las personas. Por tanto, la identificación o nombre de una persona en la tradición hispánica está compuesto de: nombre de pila (o simplemente nombre, pudiendo ser más de uno) apellido paterno y apellido materno, ordenados por intercalación; Es decir, el primer apellido de una persona es el primer apellido de su padre y el segundo es el primer apellido de su madre. Los apellidos patronímicos están muy difundidos y son aquéllos que han sido originados por un nombre de pila / nombre propio. En la antigua Corona de Castilla y en países que fueron sus colonias, se utiliza principalmente la desinencia “-ez”. Por ejemplo, del nombre de pila Lope deriva López. Sin embargo, algunos apellidos patronímicos no se transformaron y simplemente existen como el nombre que los originó, y que, en algunos casos, ha caído en desuso (como pueden ser, entre otros, Alonso, Bernabé, Bernal, García, o Simón). Otros apellidos patronímicos se forman por sintagma preposicional: Del Frade o Del Frate (‘hijo del fraile’), Del Greco (‘hijo del griego’), De los Reyes, etc. Un apellido no patronímico por excelencia es “Expósito” o “Espósito”, que a menudo se daba antiguamente a los infantes abandonados de padres desconocidos. Los apellidos toponímicos son los más difundidos en el mundo hispano. Derivan del nombre del lugar donde vivía, procedía o poseía tierras la persona o familia asociados al apellido. Muchos se encuentran precedidos de la preposición “de”, “del”, “de la” o simplemente son gentilicios. Los apellidos toponímicos son muy numerosos en español y forman casi el 80% de los apellidos navarros y vascos, en particular aquéllos que siguen a un sobrenombre (por ejemplo, ‘Otxoa de Zabalegi’, o sea, ‘Otxoa (nombre propio medieval el lobo de Zabalegi’). Algunos apellidos toponímicos son: álamo / Alameda, Barcelona / Barceló, Navarra / Navarro. También se aplica a los accidentes geográficos, o cosas de la naturaleza, de todo lo que el hombre ve y conoce sobre la faz de la Tierra: Cuevas, Hoyos, Montemayor, Montes, Nieves. Asimismo, los nombres de la flora: árboles (Olmo, Palma, Robles); de flores, muy frecuentemente adoptados por los judíos conversos y los moriscos, (Clavel, Flores, Rosales); de edificaciones o partes de éstas (Castillo, Palacios, Paredes); de animales (Toro, Vaca, Cabeza de Vaca, Águila, Aguilar, Aguilera, Cordero); de partes de una ciudad (Calle, Fuentes, Puente); y de los colores (Blanco, Pardo, Rojo, Verde). Los apellidos derivados de oficios o profesiones son aquéllos que derivan del oficio o profesión que ejercía la persona o familia asociada al apellido. Algunos apellidos de oficios o profesiones son: Alférez, Carpintero, Guerrero, Hidalgo, Verdugo, Zapatero. También tenemos los apellidos de apodos o de descripciones: aquéllos que derivan de una descripción o algún apodo de la persona o familia asociada al apellido. Algunos apellidos de apodos o descripción física son: Aguado, Alegre, Barriga, Cabello, Calvo, Lozano, Pequeño. Los apellidos castellanizados son aquéllos que no tienen un origen hispano, pero que con la influencia del idioma castellano fueron transformándose con una grafía o gramaticalmente a lo más parecido en la fonética española. Son castellanizados algunos apellidos de procedencia indígena, siendo común que algunos apellidos fueran adaptados a otros ya existentes debido a que tienen una fonética similar. Algunos ejemplos son: Farías, de origen portugués (Fariao); Gallardo, procede del francés (Gaillard); Jara, del árabe “lleno de vegetación” y Moctezuma que proviene del emperador azteca. Espero que la próxima vez que su ejercicio profesional los lleve a una situación donde surja el tema de la formación del nombre en español, esta breve enunciación del origen de los apellidos les ayude a explicar y a aclarar cómo se integran nuestros nombres. You are currently viewing the archives for May, 2013 at The Professional Interpreter.